don’t get why some folks are reluctant to do small batch canning. Yes it makes as much of a mess as big batch, and it takes up just as much space. but why deprive yourself of something special? Using a saucepan rather than a big stock pot (or slow cooker), using a smaller, ie narrower, pot for the canning, its easy enough and quick enough to can a couple of 1/2 pint jars at a time. 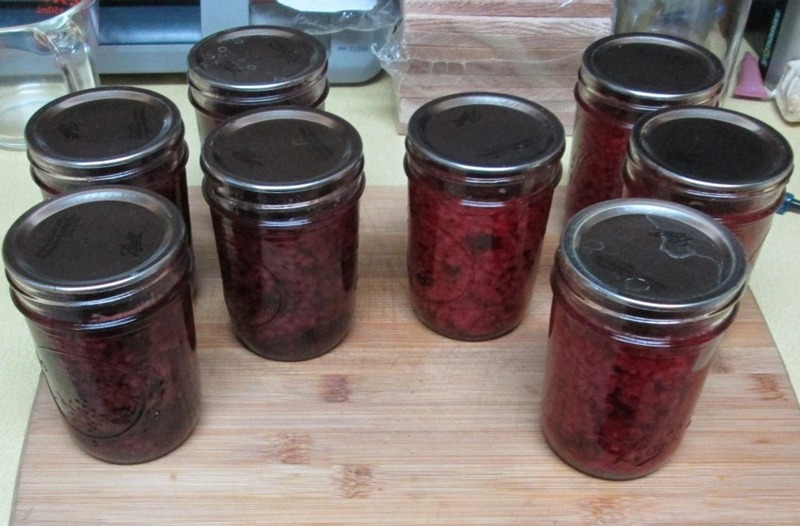 Yesterday both blackberries and rasberries were on sale, so bought enough to do four 1/2 pint jars of each. In this case, two saucepans and one canner for 8 jars. These will be part of my winter breakfasts. mmm mmm good! This entry was posted in canning, fruit, homesteading, organic, prepping, preserving, recipes, self-reliance, Uncategorized. Bookmark the permalink.